In the number 6 spot on the list of our top 10 best portable solar panels in the March solar charger. This devices holds a 4.3 star rating on Amazon as well as the Amazon's Choice badge. So, let's dive in and see if it is a good as they say it is. The March solar charger is a small, yet durable solar charger. It sizes at 7.7 x 4.5 x 1.3 inches, making it roughly the size of an iPhone 7 and weighs under a pound, 12.6 ounces to be exact. Making it easy to pack with your things when camping or hiking. This small device is packed with a 12,000mAh battery which will give you plenty of power throughout your day. One full charge of the power bank can charge your iPhone 7 up to 4 times, and a 9.7 inch iPad once. Of course, it can handle anything with a USB. Speaking of USB, the March solar charger features dual USB charging ports. Both of them have an output of 2.1A and are able to charge two devices at the same time without sacrificing power. Also included is a micro-USB port which is able to charge the power bank using a DC 5V/2A input. So you are able to charge the power bank at home before taking it out on the go. Also, following the trend of many other solar chargers, the March solar charger supports all quick charge technology. It can charge a smartphone in about 2 hours. For the solar panels, march claims that they are very efficient. The panels have a solar conversion rate of 23% with a max wattage of 2. In addition, there is no need to turn on the power bank for the solar cells to begin charging the power bank. As soon as they access sunlight, the device begins charging. So if you are hiking or hanging out outside, you can just leave it in the sun to do what its made to do. Here is where the March solar charger really excels. The thing is very durable. the device is waterproof, dustproof and shock proof. While it does have a fairly rugged design, it holds up very well under the elements. In addition, the USB charging ports are also covered by a plastic door, to protect it from water, dirt, or anything else that can harm it. However, the charging ports are vulnerable when they are uncovered, so just be careful. 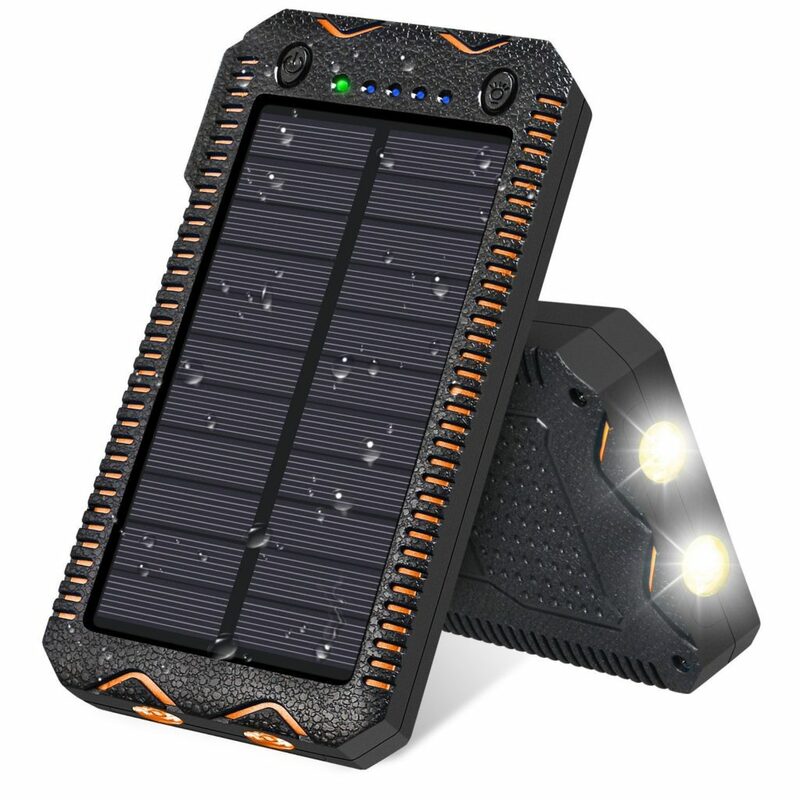 Like many other solar power banks, the March solar charger features dual LED flashlights at the bottom. These flashlights can be switched from their standard beam to an S.O.S mode, in case of emergencies, as well as a strobe in case you want to party. The other unique feature of this device is the 5 pilot LED lights at the top of the charger. While most solar chargers only feature 4, this one gives you an extra pilot light to more accurately gauge the power level of the battery. Lastly, the device also includes a lanyard for easy carrying. Using the lanyard, you can easily tie it to your backpack and let it charge either your devices or itself by the solar panel, while you are walking. Marccch, or under the seller name MNHYGFY, is a Amazon seller. There is not a lot information about the company as a whole, with only links to Amazon, meaning that Amazon is their only marketplace where their products are featured. However they are one of the Amazon Top 100,000 sellers and hold an 87% approval rating on the website. Unfortunately, within the last 90 days, 20% of their 30 reviews have been negative. Many of the reviews complaining about either cheap quality or malfunctioning products. The good news is that none of the bulk of customers have positive reviews of the March solar charger. The March solar charger is highly durable. The rugged case makes it waterproof, dust proof, and shock resistant. So you do not have to worry about this device accidentally breaking while you are out hiking or any other activity. The dual USB 2.1A charging ports allow for quick and reliable charging of your favorite device whenever you need it. Plus the 12,000mAh battery capacity will ensure that you always have power. It has enough power to charge a standard smartphone nearly 4 times on one charge. A great feature of this solar charger is the lanyard attached to the top corner. This makes it easy to strap to a backpack and let it charge while you are hiking. The company claims that the solar cells have a 23% conversion rate, making them very efficient. That way, if your power bank runs out and you need to charge your phone, you can let the power bank charge itself while you are walking or relaxing. The March solar charger is also very compact and lightweight. Just about the size of a smartphone and just as light. Meaning you will not have to worry about any extra weight to carry around. The dual LED flashlight feature is very nice, in case of emergencies or for use at night. Also the 5 LED pilot lights make it easy to gauge the power level of the battery. While it is small and lightweight, it can be bulky due to the design. This can be annoying when strapping to a backpack. Many customers have complaints about the solar panels not being as efficient as the company claims. Also, the company recommends DC charging over solar charging. The battery is far smaller than others we have reviewed. However, with the low price tag, this is understandable. The company has received various negative reviews about their products. This can be a red flag for some people. While the March solar charger is durable and convenient to use, the solar capabilities have been reported to be a big let down. In addition, many of the reviews and feedback for this product and the company in general is very sketchy. However, the battery capacity is decent for the casual consumer, and the dual USB ports are a nice touch. Overall, it is more of the same with nothing very unique or outstanding about it. The March solar charger is indeed very durable and portable, but it just does not have the power to back it up. The battery is much smaller than many other brands we have reviewed, the reports about the efficiency of the solar panel do not inspire confidence, and the negative feedback of the quality of other products needs to be taken into account. However, this may be a good purchase if you just need something cheap as right now you can pick it up for $15.99 on Amazon.com. But if you are willing to spend the money for something better, you might as well. Here are some top questions that I found for people seriously considering buying the March Solar Charger. How fast will the power bank charge using solar? Factory tests place the charging time at 28 hours using only solar energy. The company recommends charging it via wall outlet. What devices can be charged by this solar charger? Any device that uses an USB to charge will work. However, bigger devices will take longer to charge.